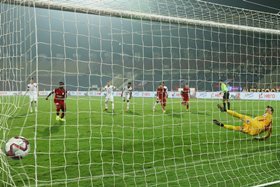 Bartholomew Ogbeche is now the joint-top scorer in the Indian Super League after netting his eleventh goal of the season as Northeast United settled for a 1-1 draw with Delhi Dynamos at Indira Gandhi Athletic Stadium (Guwahati) on Thursday. The home team had a chance to break the deadlock on the half-hour mark when the former Nigeria international tried his luck as he made his way towards the top of the box to head the ball but his effort was just wide. Three minutes after the restart, the former Paris Saint-Germain super kid saw a shot narrowly drift wide and had two more chances to open the scoring before Delhi Dynamos' Spanish midfielder Marcos Tébar struck in the 67th minute. But the lead did not last long with Ogbeche restoring parity from the penalty spot in the 70th minute after he was felled in the box. The Northeast United number ten made way for Mascia with three minutes left on the clock. The highlight of Ogbeche's performance in the ISL so far was his hat-trick against Chennaiyin, his next challenge comes up against Mumbai City next Wednesday.